About two weeks ago, our family of three became a family of four when we welcomed Haddie into the fold. She's completely amazing and playing with her and her sister has completely consumed all of my free time since she's made her debut. That's why I haven't introduced her here until now. So, everyone, meet Haddie. Mom is doing great. It takes a lot to knock my girl down, so I'm not at all surprised that she's fantastic. That seems to be how she spends most of her time. Ellie absolutely adores Haddie. Every morning when we get her up the first thing she wants to do is check on Haddie to make sure she's OK. And she always marvels at how little everything is on her. Her little hands. Her "little, stinky toes." The labor was long, but worth it. Of course, I say that and my real role was observer and moral support. But I feel fairly confident that Gina would agree. Haddie is a really chill baby. Not a lot of crying. Seems to be perpetually hungry. And she's a pretty good sleeper so far. Less than two weeks old and we can actually get four uninterrupted hours on a good night. So, that's the big update from Texas. I've got other writerly things that I want to write about and share with you all, but those will have to wait for now. 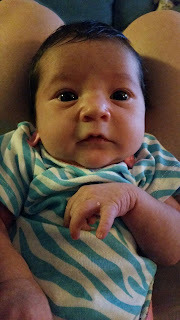 At the moment, I'm completely occupied by a new girl and squishy cheeks.